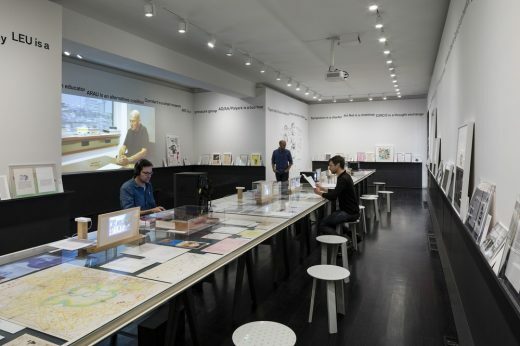 Home > Events > Columbia GSAPP incubator at NEW INC.
Columbia GSAPP incubator at NEW INC.
Columbia GSAPP launches incubator at NEW INC.
Columbia University Graduate School of Architecture, Planning and Preservation launches an architecture, culture and technology incubator at NEW INC.
New York, NY, December 1, 2015—The Columbia University Graduate School of Architecture, Planning and Preservation (GSAPP) inaugurates the GSAPP Incubator with its first season of members. The GSAPP Incubator is an initiative for the school’s alumni, providing a collaborative environment for exploring new ideas and developing innovative projects that encompass culture, technology and the city. The co-working space encourages discovery and an open exchange among a diverse group of participants engaging in topics and interdisciplinary methods that expand the possibilities of architecture. Directed by Assistant Professor David Benjamin, the Incubator is located at 231 Bowery along with the New Museum’s NEW INC. 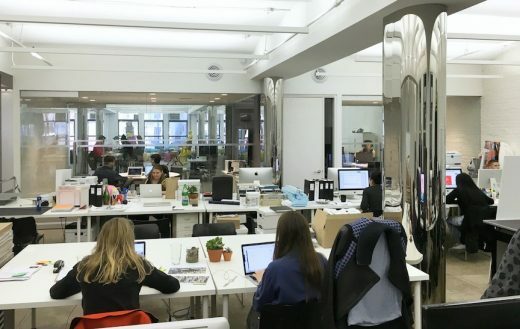 The GSAPP Incubator blends a professional setting and culture of entrepreneurship with the communal creative energy and rigorous discourse experienced by students during their time at Columbia. A membership at the incubator eases the transition between school and practice, and allows recent graduates to share experiences and skills while building their professional network and connections to New York’s technology industry. Members also organize programs and workshops to be held both at NEW INC and at Columbia’s Morningside campus to bridge the two venues and maintain dialogues among current students, faculty and alumni. The GSAPP Incubator is a unique university-led incubator spanning multiple disciplines and building on the strengths of the school and its faculty, the resources of NEW INC and New Museum, and relationships to the technology industry of lower Manhattan. It encourages experimental and alternative modes of practice that encompass research and production: the eleven inaugural member groups are developing a variety of cutting-edge projects spanning virtual reality and digital technology, critical discourse and publishing, civic issues and public spaces, urban regeneration, emergency response, and more. A(n) Office is an architectural practice based in Detroit and New York, founded by Marcel López-Dinardi and V. Mitch McEwen. Their work engages issues of migration and democracy through political economy, urban design, architecture, exhibition and installation work. A(n) Office was commissioned by the US Pavilion at the 2016 Venice Architecture Biennale to develop a speculative design project for a 7 acre City-owned property in Detroit. In addition, the group will prepare Methexis: The Algorithmic Recitative, a solo exhibition at Museum of Contemporary Art Detroit that expands its House Opera project into new urban research. Established by architects Martin Kropac and Hana Petrik in collaboration with the Academy of Arts, Architecture and Design in Prague, City and Disaster is a series of international workshops addressing responses and advanced solutions for natural or man-made disasters in urban contexts. Workshops held in New York and Prague have resulted in manifestos and proposals for architectural, technological and cultural solutions that are preemptive, immediate, and long-term. They are preparing workshops to be held during 2016 to address cultural heritage in Bangkok and Bogotá. Consortia is a design office and think-tank for digital, physical and conceptual projects founded by Christopher Barley in 2014. The office oversees projects in design, research, and cultural consulting for academic and cultural institutions as well as brands and corporations. This year they oversaw the digital strategy for the Chicago Architecture Biennial, and are developing research projects for Audi on big data, the connected car, digital lifestyles, and the future of retail. Columbia GSAPP alumnus Dong-Ping Wong is among the group of architects, designers, engineers, strategists and scientists building the world’s first water-filtering floating pool and developing other interdisciplinary projects. George Valdes is VP of Product at IrisVR, a company building software to edit, visualize, and share 3D CAD models in virtual reality. It is currently in its beta program and will launch the product during 2016. Forrest Jessee is studying the possibilities of creating a textile that can both form around an object or person but also have structural properties to generate its own program, like clothing detaching from the body to become a shelter. The project seeks to find similarities in the geometry of the body and shelter to allow a dual program. It complements Jessee’s material investigation that relates to program and exploring lightweight thermal properties. Dimitri Kim is an architect whose work in research, teaching, and publishing have led him to develop Patronarch, an online platform conceived for emerging professionals. Currently in prototype form, the project allows architects to meet, communicate and establish partnerships with local communities in order to realize architectural projects. Founded by Nikolay Martynov, Artem Kitaev and Leonid Slonimskiy, KOSMOS is a research-driven architectural practice that addresses density and urban issues. They include the competition-winning project Foam Space at the 2015 Ideas City Conference in New York. KOSMOS aims to develop a new form of spatial practice on the edge of physical and digital architecture. Columbia GSAPP’s alumnus Martynov’s focus is “Anonymous architecture” – used by masses while remaining constantly mute. Dimitrios Spyropoulos is an independent architect whose current research aims to scrutinize the possibilities of how an automated mobile transportation network can affect the existing urban fabric and its potential for a more efficient, finely “orchestrated” city. Xin Wang is Design Principal at DesXY design studio based in Philadelphia and Shanghai. Based on the socio-environmental theory of Urban Acupuncture, Xin Wang explores how small scale interventions transform the larger urban context and solve urban problems through design of strategic architecture. : is a workshop on architectural practices and ideas based in New York City. Founded by eight members trained as architects at Columbia GSAPP, : aims to carve out a space for critical reflection on chosen topics within the field. : is currently examining the spaces and modes of architectural practice that have emerged under the banner of “alternative” – spaces which ostensibly operate in opposition to the institutions that surround them. Founded in 1881, the Graduate School of Architecture, Planning and Preservation at Columbia University in the City New York City confers Masters Degrees in Architecture, Advanced Architectural Design, Urban Design, Urban Planning, Historic Preservation, Real Estate Development and Critical, Curatorial, and Conceptual Practices in Architecture as well as Doctoral Degrees in Architecture and Urban Planning. As a leader in developing new forms of design research and scholarship to open up new territories for more meaningful practices of architecture and the design of cities, the school combines pioneering experimentation with an uncompromising engagement in New York and cities across the world, offering students an unparalleled spatial network of resources and exchange. Under the leadership of Dean Amale Andraos, Columbia GSAPP is a laboratory for learning that weaves together cutting edge design skills, incisive critical thinking and new forms of knowledge as students and faculty engage one another in a spirit of intellectual generosity that strives to re-imagine the future of architecture, cities and the environment. Copyright © 2015 Columbia University GSAPP, All rights reserved. December 1, 2015 in Events.